I love this ending SO MUCH!!!!! This is one of my favorite series of all time! Fantastic Ending to a Fabulous Series!! Spencer, Daisy and Dez start this final book in a desperate situation. The Rebels are disappearing and things aren't going their way. As they figure out what they need to do next, the task seems impossible. They can't afford to lose, though, so they set off to accomplish it. Of course, that just leads to the next task and this book doesn't let up until the very end. I have enjoyed this series from the very beginning and this was a fabulous way to end it! Spencer, Daisy and Dez have come a long way together. Spencer and Daisy are never quite sure which side Dez is on and there are times that they need to trust him and hope he comes through for them. There's never a dull moment as they go from one situation to the next with hardly any down time. 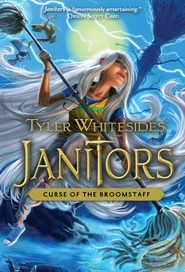 I've read this entire series with my children (it was originally a Costco find for me) and we have been thoroughly entertained while reading about trash, toxites, glopified cleaning supplies, Rebels, Witches, Sweepers and, of course, elementary school janitors! My children asked to keep reading more chapters frequently and I was glad because I wanted to continue reading, too! Questions are answered and there is an unlikely hero in the end. It's a fun, creative, entertaining series, for both kids and adults! I am a Tyler Whitesides fan and I look forward to reading what he comes up with next! 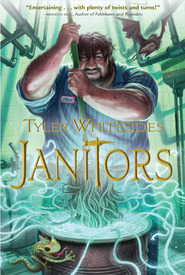 This is book 5 of the Janitors series and final book. I have read only 2 of the books and would suggest you read them in order would be best. So you wouldn't know who were the heroes or who were the villains. Since all the answers are revealed in this book. Janitors are the good guys. Cleaning tools are weapons and tools. Depends on who or what changed them. There are rebels who are fighting the sinister Bureau of Educational Maintenance. The schools are battlefields. They are making kids not want to learn, daydreams trying to ruin education. Another setting is a garbage dump. A big one. With garbage monsters that talk trash. This series is creative, the heroes are not what you expect them to be. People keep surprising you for good or bad. Spit can be a good tool. There are monsters, witches, sweepers and kids with half monsters. It is a exciting series with surprises around the corners. It is a clean read or dirty one. That is filth as in mud, trash and glop. It is a fun book to read. Someday I would like the time to read all 5 books in a row in this series. That way I won't forget who is supposed to be the good or bad guys. 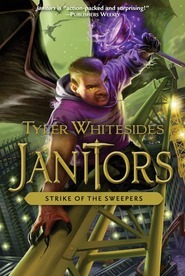 I was given this ebook to read for free so I could give a honest review of Janitors 5 : Heroes of the Dustbin and be part of it's blog tour. What a FANTASTIC ending to an AWESOME series! I love how things kind of came full circle and the fun twist of an ending! This series has been a phenomenal ride keeping everyone on the edge of the page wondering what is going to happen next. Very creative-- especially with all the janitorial things that were used and how they received their magical powers. I also enjoyed how the kids pulled together and ultimately became the true heroes. This is one series not to be missed! This was a fabulous ending to an incredible series. It sucked me in and I couldn't put it down. I love how each character had a specific role to play the take down of enemies. And it truly was "action-packed and surprising!" I would highly recommend this to any and everyone who loves a good, fun series to read either by themselves or to their kids. Whitesides has done it again. He's written another winner. 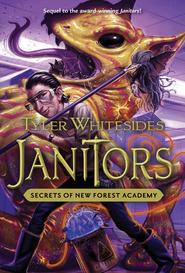 I was eager to find out what was going to happen to Spencer and Daisy and their allies in this fifth and final volume of the Janitors series. After the somewhat shocking end of book four I was definitely anxious to see hour it would all end. And Whitesides did not disappoint. Things start off with a bang when Spencer's family is taken by the BEM in an effort to force him to reveal the location of the bronze nails. This series has been a delight to read with the imaginative use of everyday objects in magical ways. I've admired the author's ability to make seemingly boring objects (toilet plungers, cleaning sprays, etc.) exciting and fun. And once again, new inventions and possibilities are introduced (drain cleaner that eats through walls and floors for example). 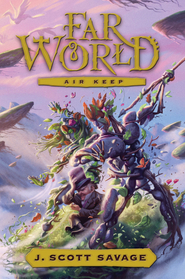 The book moves quickly into the action and doesn't let up until the end, which one would expect from the final book in a series. I found the ending very satisfying and even a bit surprising. The author manages to integrate plenty of surprises in terms of plot and character which made for a great read. I'm actually sad that the series is over. I very much look forward to reading more from this author and seeing what else he comes up with.